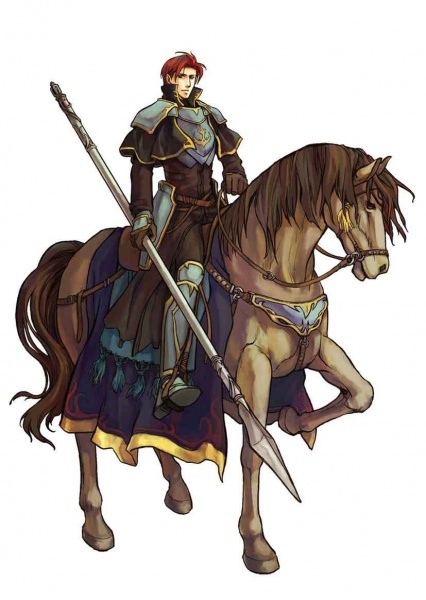 Warning: This article will contain multiple spoilers for Sacred Stones and Blazing Sword. Read with that in mind. When I first began thinking of a game to write about for Operation Rainfall Origins, several games popped into my head. Namely, Bastion, Ragnarok Online, Harvest Moon, and Sacred Stones. 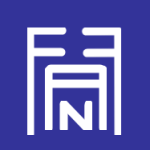 I pondered the question for a while, making “final decisions” about which game I would write about and then backing out, thinking of all the good times I’d had with each game. But when I kept coming back to Sacred Stones, I realized it was the right choice. Our lovely chief editor, Jonathan Higgins, mentioned that I’d be able to change my choice, but once I had decided I knew deep down that Sacred Stones really was THE game, the one that had sucked me away from the world of anime and turned me into the gamer I am today. I was first introduced to Sacred Stones the same way I came to know most of these games. One of my close friends had a Gameboy Advance, and every so often she’d lend it to me, giving me a chance to try out the many games in her collection. Pokémon Crystal and Harvest Moon: Friends of Mineral Town were the first two games I came to know this way, and I loved them both. But it was Sacred Stones that really pushed me to buy a Gameboy SP of my own. My very first playthrough of the game was fairly awful – I actually never finished, using Seth all the time (which was a giant mistake…ah, those days of exp-stealing ignorance) and getting stuck on Eirika’s route on the Scorched Sand chapter. I know, but hey, cut me some slack – I was 12! After beginning a new save file out of frustration, I chose Ephraim’s route instead, and took care to use Seth sparingly. I quickly developed a bond with my favorite characters, especially with Vanessa, Lute, Forde, and Ewan. As an early riser since childhood, my parents encouraged this “good habit”, letting me do whatever I wanted with the extra two to three hours before school started that I gained by waking up early. And so I started every morning with a chapter of Fire Emblem. When I had extra time, I would squeeze in more chapters – they were short enough to keep me going, “Just one more!” and find myself playing into the wee hours of the night. 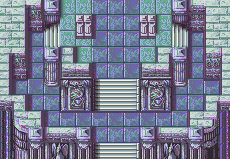 I finished the second playthrough of Sacred Stones relatively quickly, and it went much better, as I learned to take advantage of arenas and the Tower of Valni. Since then, the Fire Emblem series has always held a special place in my heart. Upon playing Fire Emblem: The Blazing Sword, I cried when Ninian “died”, I was fascinated by the morphs, and I loved the replay value – so many different characters and support conversations to explore. However, Sacred Stones was the very first Fire Emblem game I had ever played, and as such, has always been my favorite of the lot. At this point, my Ragnarok Online addiction coupled with my insane club schedule had led my grades to drop, so I set Sacred Stones aside for a while. A few years passed, and after my academics had stabilized somewhat, I picked it back up again. Playing Eirika’s route again this time, I made it through successfully and used a different set of characters from before – I loved getting to know all the different characters and their personalities. Also, I loved having the option of choosing between the two routes – though I did find it a little bit sad how the route you didn’t choose was always bound to end in disaster. The many characters of the Fire Emblem games gave them infinite replay value for me, and the graphics and animations were always wonderful. The animations for the critical hits were even cooler, and I got chills every time I recognized the starting sequence for a critical. I wasn’t initially a fan of the music though – I’d gotten used to the lush orchestrals of Nobuo Uematsu and Harry Gregson-Williams, and the synthesized music seemed overly cheesy to me. But over time, I grew to love it. Whenever I play Brawl and hear Fire Emblem’s main theme on the Castle Siege stage, I always experience a rush of nostalgia and some sort of strange patriotic pride for a country that doesn’t exist. Phew…after listening to that, I feel impelled to grab a sword and march for freedom and hope right now! Classes made the game even more interesting – I liked how I could choose whether or not Amelia would be a paladin or a knight, and determine whether or not to make Ewan into a Druid (I’m guilty of doing this every single time). I liked how the Pegasus knights could go where the cavaliers could not, and how certain classes were better suited for rescuing other characters. The costumes for each character and class provided loads of material for my cosplay-obsessed mind – I’ve been hoping to dress up as Eirika someday (blue hair is awesome! ), and I might go to a convention as a generic shaman soon. Another unique aspect of the Fire Emblem games that I enjoyed were the support conversations. Each time I’ve played through – six times and counting – I’ve paired different characters together, testing out the bonuses, looking at how relationships formed, finding out more about each character’s personality and past. The small support conversations gave the player a framework for a character’s background which he could then use his imagination to build on. …And that was how I became an active participant in Fire Emblem’s fanfiction community. I’ll be the first to admit it, I like to read fanfiction. Wait, People Stay Dead and Weapons can Break? One more thing I liked about Fire Emblem was the harsh finality of death. I know, I know, that sounds incredibly morbid of me to say. But after playing Pokémon (Oh, just let them faint, you can always take them to a Pokécenter later) and Final Fantasy (If a character dies, just wait til the next save point! ), I liked how death in Fire Emblem was final. It made me treat my characters with more caution – knowing that one wrong move could result in a necessary replay of that chapter (I never moved on if a character died, save for that very first playthrough where Ross died and I forgot to recruit Amelia – yeah, let’s not talk about that again, I was young and silly). 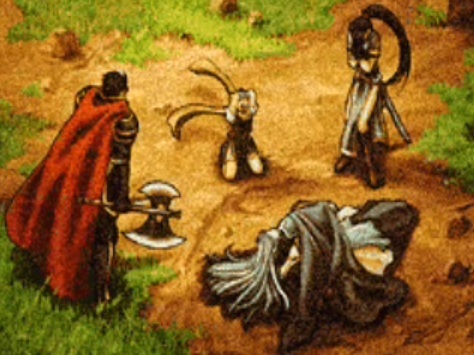 The role of death in Fire Emblem just made the game that much more realistic to me – no resurrections, no 1-ups, no phoenix downs. Adding to the realism factor, weapons can and will break, your characters can only carry so many items, and flying units are especially susceptible to arrows. Even though I have failed many a chapter due to hasty placement of a pegasus knight coupled with an enemy archer’s attack, I liked the challenge of keeping all the different variables in my head while making my moves – what weapons are the enemies carrying? How many more times can I use this weapon? What kind of magic will that druid be using? How many hits does that ballista have left? It kept me on my toes, and I loved it. I almost felt like a real war general at times, silly as it may sound. Have you ever noticed? The main antagonists of Fire Emblem are usually never truly evil. Nergal, whose tragic love for his beloved and determination to save her caused him to study dark magic, which eventually warped him to forget his original goals and his own children. Lyon, who in trying to save his country brings forth a historic demon who surpasses all known evils. Zephiel, the kindhearted, gentle little boy warped by his fathers’ murderous intentions. Each one was initially good at heart – only to be corrupted by some evil force or led astray from his original goals. I liked being able to sympathize with the main antagonist and not just battling against a faceless drone of pure evil. Lyon. Lyon. What are you doing. Lyon STAHP. STAHP IT. All in all, I fell in love with Fire Emblem’s storylines, versatility, characters, classes, strategy-based gameplay, graphics, animations….the list goes on and on. 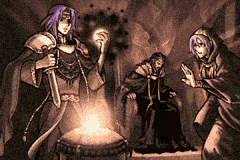 It’s been a real trip down memory lane writing this article, and now I think it’s time for me to start another long overdue replay of Sacred Stones. That’s all for now, folks! Stephanie loves MMORPGs. Especially Ragnarok Online. She also is a bit obsessed with Fire Emblem. That's all you have to know about her.